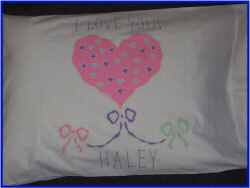 All of our Pillowcases are Personalized by hand using a non-toxic fabric paint pen. 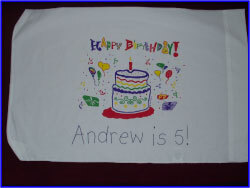 This is NOT a typical fabric marker and does not bleed. 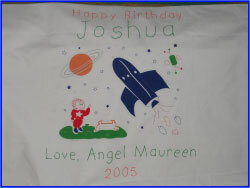 The Personalization looks as if it were screen printed along with the rest of the design! 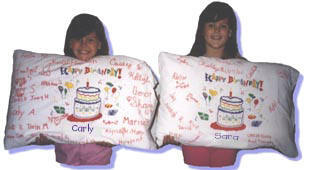 STANDARD PILLOWCASES can be Personalized with UP TO 15 characters. 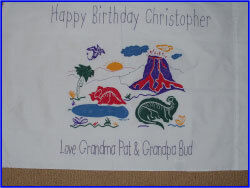 Names are placed HORIZONTALLY along the TOP of most designs. 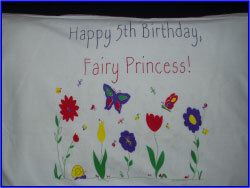 "Hearts of Love", "Happy Birthday" are placed UNDER the design. 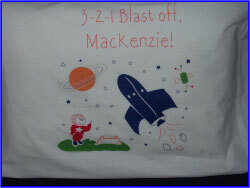 TRAVEL/TODDLER PILLOWCASES are ONLY personalized on the MONOGRAM designs. 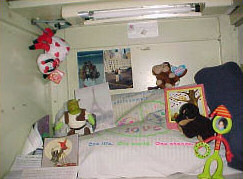 Initials are limited to 3 characters. 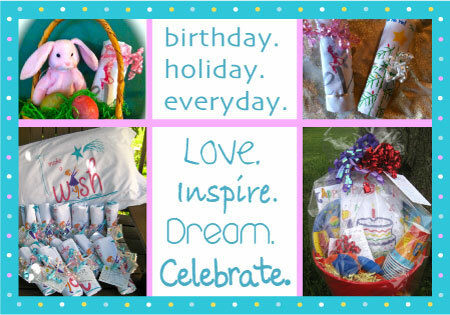 Click HERE for details on Gift Wrapping. Click HERE for details on Gift Certificates. 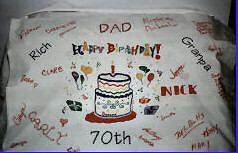 Another special one I made for my father's 70th Birthday! 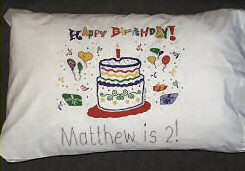 Every relative and friend that attended his surprise party secretly autographed the pillow case which we gave him with his cake! That's a lot of signatures! My son's preschool class sent a special Thank You to a platoon in Iraq their Christmas Care Package. 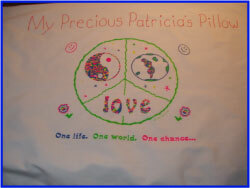 A magical question becomes a keepsake! 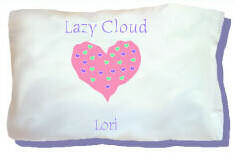 The couple were staying at the Lazy Cloud B&B.